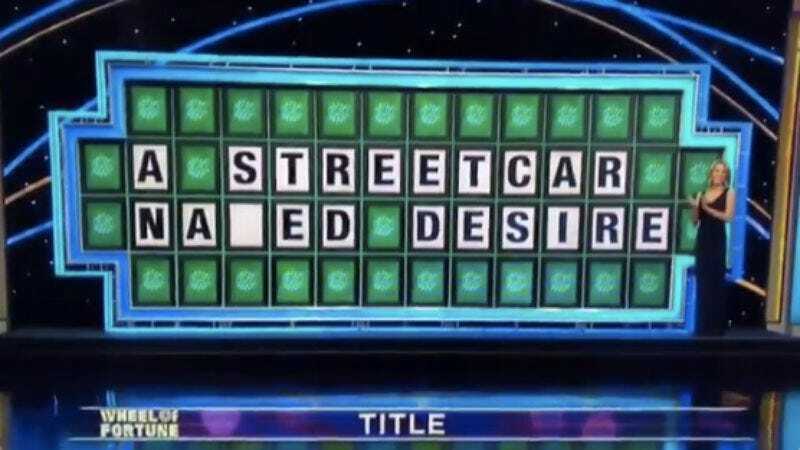 You don’t need a degree in theater or film history to know A Streetcar Named Desire, which, outside of anything by Shakespeare, is arguably the most famous play ever staged. It won the 1948 Pulitzer Prize for Drama in addition to four Academy Awards for its 1951 film adaptation, which has since gone on to permeate pop culture for Marlon Brando’s iconic performance and feverish cries of “STELLA!” A Simpsons episode is based around it. It’s been referenced on Seinfeld, Modern Family, and Malcolm In The Middle. Panic! At the Disco sang about it. Lil Wayne rapped about it. Wu-Tang rapped about it. So there is no excuse, Kevin. No excuse why you would bungle what’s undoubtedly the easiest layup to ever grace Wheel Of Fortune. Watch it below. Yep, A Streetcar Naked Desire. The best part is the heavy cloak of disbelieving sighs that follow his call for “K,” which is punctuated by a whooshing, sarcastic “noooo” by host Pat Sajak. Viewers had a field day, obviously, and, to be quite frank, Kevin deserves every pithy tweet. This is what happens when you defund the arts.